On this date, the battle of Leuthen was fought between the Prussians under Frederick the Great and the Austrians (sorry Erik) commanded by Charles of Lorraine. Frederick had already defeated a Franco-Imperial (Reichsarmee) army at Rossbach a month earlier, but found himself retracing his steps in order to maneuver the Austrians into battle after they threatened Berlin and captured the Silesian city of Breslau. It being late in the season, the Austrians confusedly evacuated Breslau on their way to winter quarters, but were caught out by Frederick near the village of Leuthen, grounds which the Prussian army had used many a time for training maneuvers. Prussian hussars rushed to fix the enemy before it could escape. Frederick made use of his detailed knowledge of the terrain to demonstrate in front of the enemy’s center and right wing, while a detachment of his infantry marched away from the main Prussian formation, disappearing behind a ridge of low-lying hills. The Austrians, after witnessing enemy troops apparently abandoning the battlefield in standard march column formation, were shocked to see those units emerge from behind the hills opposite the weak left flank of the Austrian position; Habsburg surprise turned to terror as the Prussian foot quickly wheeled onto the attack using Frederick’s now-famous oblique order. Austria’s army fell into confusion as it attempted to rotate its west-facing front 90° to the south, where the Prussians had reformed and were quickly approaching. Austrian defenders in the village of Leuthen offered their lives to buy their compatriots enough time to form a scattered line, and cannonfire, musket shot and cold steel rang out for several hours until night fell. Outnumbered 2:1, the Prussian flanking maneuver allowed Frederick to defeat the over-extended Austrians; Habsburg numbers did, nevertheless, make Prussian troops pay for the victory with heavy losses. For only the billionth time in history, the victorious commander exclaimed that just a few more hours would’ve allowed the battle to become the most decisive in a century, but the Austrians managed to limp off toward their Bohemian base to the south. Over the winter and into the spring Prussian forces mopped up the enemy’s remnant garrisons in Silesia. The war would continue with the anti-Prussian forces weakened: Austria managed to fend off a Prussian offensive in 1758 while their French allies lost interest in future interventions in central Europe. Prussia was buoyed by new British subsidies, but after a diversion to fend off a Swedish threat, the rising might of Russia would focus the philosopher-king’s attention on this implacable foe in the east. Prussia managed to barely deflect renewed assaults on all sides until the fortuitous accession of a Germanophilic tsar to the Russian throne allowed another advance into Austria, courtesy of “the miracle of the House of Brandenburg.” Within a year, another successional struggle in Russia turned the tide against Frederick once again, while a new ministry in Britain closed its purse to further Prussian subsidies. An exhausted peace was finalized in 1763. So much for my attempt to summarize a battle and war in a paragraph. On a related note, here’s a table of Frederick’s battles that I compiled from Duffy’s The Army of Frederick the Great for my warfare course. I did it pretty quickly the day before class and haven’t checked it since, so let me know of any errors. 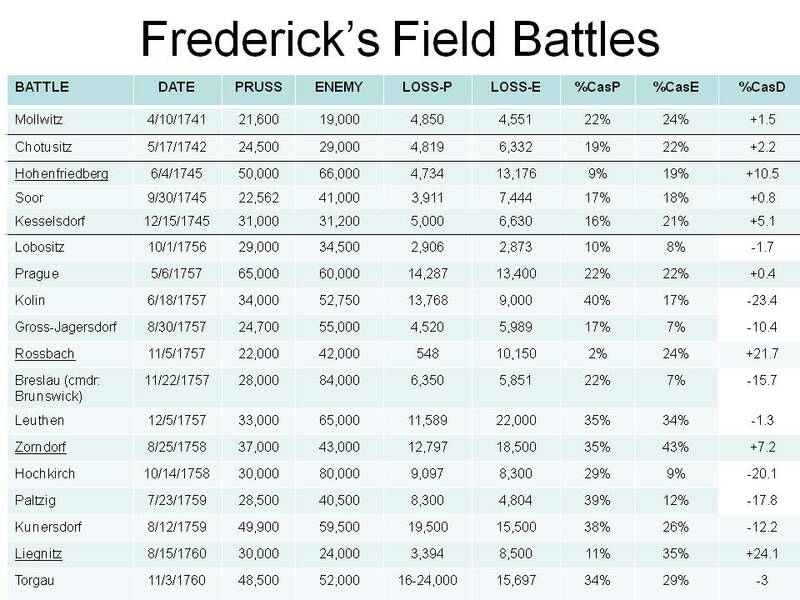 with a few exceptions, the later battles cost Frederick a lot more (percentage wise) than his enemies. Bye-bye drilled veterans! Duffy, Christopher. The Army of Frederick the Great. London: Emperor’s Press, 1996. Duffy, Christopher. Prussia’s Glory: Rossbach and Leuthen 1757. Chicago: The Emperor’s Press, 2003.